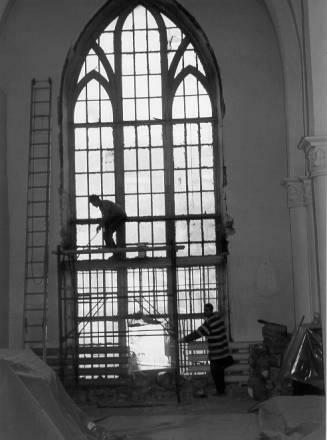 Workmen removing the old windows. After receiving our Vladivostok church back from the government, we initiated a project to replace the old windows in the building. The building originally had stained glass windows, but no one could remember what had happened to them. When we received our church back from the government, it had clear glass windows with broken and missing panes and rotted wooden frames. During the long winters, the church lost heat through the broken windows, and parishioners had to stay heavily bundled up during Mass. This was clearly unacceptable so we began looking into the best way to replace the windows and frames. As it happened, our building superintendent, Andre Udovichenko, knew of two stained glass artists, Alexei Ivanovsky and Vladimir Ivanov, who had designed and installed pieces in private homes and commercial properties. They were from Belorus and had never produced church windows. Nonetheless, after checking into their track record and artistic sensibilities, Fr. Myron commissioned them to design the new windows. The first one to be created would be the 30-foot-tall Annunciation window. Alexei came to Vladivostok for the first time in 1995. A year later his firm was invited to participate in the church’s renovation. However, it was necessary first to do some work on the building itself so that it would be fit for divine worship, and only after that could the windows be installed. The basic source of inspiration was the Biblical text of the Annunciation itself. The first version of the window which the artists showed Fr. Myron had Mary standing, but that wouldn’t square with the second proposed window, which would be placed opposite the Annunciation in which Mary would appear under the title Mary Mother of the Church, and would be standing, surrounded by the apostles. Because the number of human figures would be greater, but each of smaller size than on the Annunciation window, there might be disharmony between the windows. So Alexei and Vladimir decided to picture Mary sitting, because it would reduce the size of her image. After the first design, they made a second, and then finally a third version which was finally approved. “We ordered the glass itself in Poland,” Vladimir adds. “It is a rare type of glass-opal. It isn’t produced in Belorus, nor in Russia, and not even in Europe! They make this glass only in the United States, and it comes from there to Europe and Poland.” The problem is that it is not always possible to obtain the necessary quantities of the rare glass, so of course the artist cannot use that glass for the whole stained glass window, but combines it with other glass. A list of windows needing replacement was given in the Vladivostok Sunrise newsletter, along with their sizes and approximate costs. Individuals, families, and groups “adopted” windows and slowly, the funds began to come in. Fr. Myron determined that each window should depict an event in the life of Mary, as the church itself was named in her honor. It was planned that the Annunciation window would be the first one installed. The cost of its outer frame and glass was donated by the German Catholic organization Renovabis. 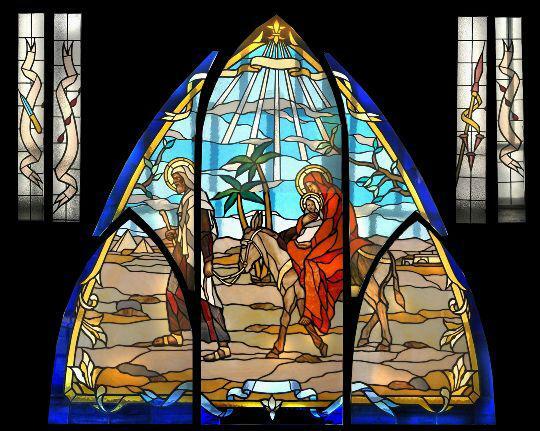 The stained glass and inner frame were donated by Mr. and Mrs. Terrence Kopp and family of Minnesota. The windows were created in sections in Belorus and the final assembly took place in Vladivostok. The artists Alexei and Vladimir never actually saw the larger windows before the final assembly as they were too big for their shop. They had to photograph the separate parts and paste the pictures together to get some idea of the whole. So the large Annunciation window was sent in sections from Belorus across the border to Russia. That wasn’t a simple task because the import-export laws between Russia and Belorus are always changing. Furthermore, the border crossing took place during the difficult time of the Chechen Conflict so the customs agents had to minutely examine every item. 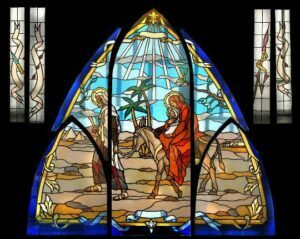 With God’s help the window did arrive and the final process of mounting the window began. At this point in the church renovation, two of the three steel-and-concrete floors had been removed. The lowest artificial floor still remained, along with the original (ground) floor below it. However, some of the outer edges of this last artificial floor had been removed, so the floor did not reach all the way out to the walls. Railings protected people from slipping through to the floor below. The gap between the floor and wall allowed the artists enough space to install the window which extended below the level of the artificial floor. 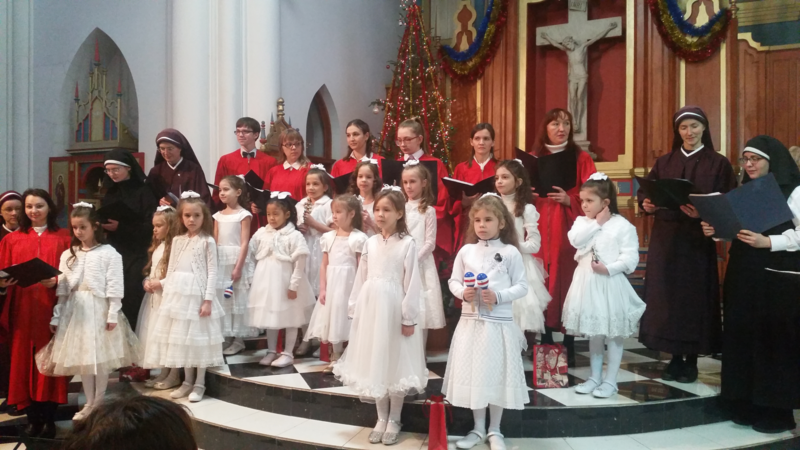 On March 25, 2000, the 2000th anniversary of the Annunciation, we celebrated the Jubilee with Bishop Jerzy Mazur, who came from Irkutsk. At the Mass, Fr. 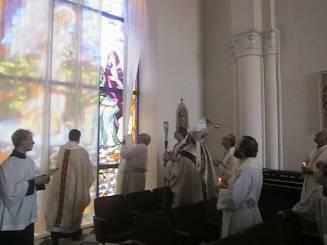 Myron unveiled the window depicting the Annunciation and it was blessed by the bishop. Mr. Kopp and two of his children were present for the dedication. Five other American benefactors and representatives of neighboring parishes also attended. During the Mass, Bishop Mazur blessed the souvenir candles that had been produced to commemorate the event. Attendees renewed their baptismal vows and the bishop also confirmed eight parishioners. Throughout the next decade, other windows were installed, one by one. Additional information can be found in our newsletter about the window designers and creators (Issue No. 33), the installation of six more windows (Issue No. 38), three more (Issue No. 41), the Coronation window (No. 48), the finding of the Child Jesus in the Temple (Issue No. 49), and others. Images of these windows are also found in our newsletters as well as throughout our website. Today, the beautiful windows serve as an excellent means of catechesis. When viewing them, parishioners are reminded of the miraculous events in the lives of Jesus and Mary. Tourists and visitors to the church also learn of Mary’s outstanding role in our redemption and in the life of the Church.